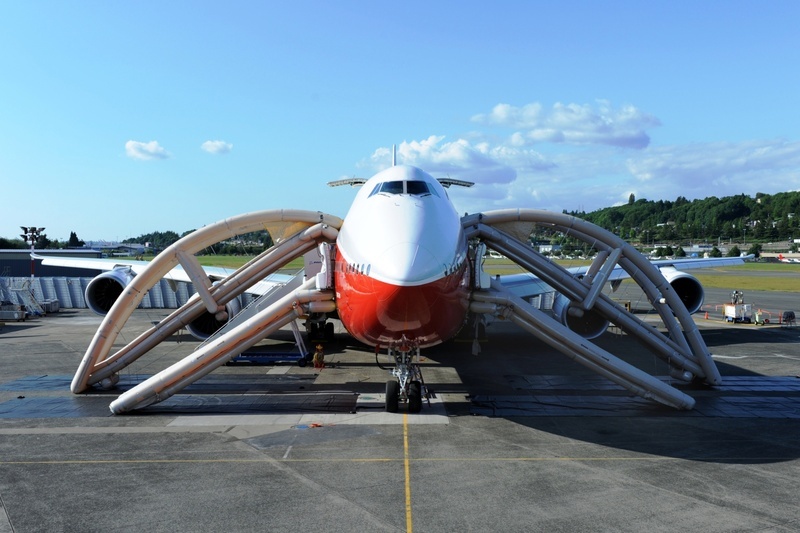 Came across this photo that shows Boeing’s newest jumbo jet, the B-747-8, with its emergency slides deployed. What caught my eye is that the upper deck slides now have a built-in structural support in the form of an arch. Considering how far above the ground the upper deck is, I guess the arch provides support against gusting winds. Talk about a fun-house slide! On a related note, here’s a short video showing the deployment of the upper deck slide on an Air New Zealand Boeing 747-400, the previous generation of the plane. The slide’s support structure is less elaborate, but it is still interesting to see how it deploys. Let’s hope I never have to see one of these deploy in person. Related link: Airbus A380 upper deck slide deployment. This entry was posted in Uncategorized and tagged 747, aircraft, airplane, Boeing, deployment, emergency, evacuation, slide by christao408. Bookmark the permalink. @stevew918 – Ooh Steve, you must belong to the 100k elite group! Can you treat me to the upper deck too? Very interesting. I have never seen a slide deployed and I hope you and I and actually all never have to see or use them! My goodness, that brings the 747 down to size! I’m glad you haven’t had to use the slides — hope they never are deployed for you ! wow! I hope you and anyone else for that matter, never have to use those slides. @rudyhou – Isn’t it cool? Much better to see it in a demo rather than real life.